The Indian black turtle (Melanochelys trijuga) or Indian pond terrapin is a species of medium-sized freshwater turtle found in South Asia. Despite its name, the color of its upper shell or carapace can vary from reddish to dark brown and black with yellow streaks running along its length. The underside or plastron is uniformly brown in color. The face of this turtle may have yellow or orange marks and spots, with color varying between subspecies. The size of the species may vary from 38 to 45 cm. The Indian black turtle inhabits a variety of water bodies including ponds, marshes streams, rivers and artificial water bodies like rice-paddies, watering holes etc. The species is most active during early morning and evening, spending most of the day basking in the sun. The Sri Lankan subspecies, which has a flatter carapace, tends to spend the day in burrows. The species typically forages on aquatic vegetation along the edge of the water. It is omnivorous, with a diet ranging from aquatic plants to aquatic insects and carrion. Indian black turtles may sometimes be seen to aggregate alongside the carcass of a large dead animal. The Indian black turtle breeds during the wet season, between August to October. During this time the male becomes particularly aggressive and starts chasing the female, biting her on the neck. The male attaches itself to the top of the female during mating. Once mating is completed, the female digs a nest in the ground or occasionally in a pile of rhinoceros or elephant dung, using the left hind leg to excavate the nest and right hind leg to clear the excess material. Two to six individual clutches of eggs are laid in burrows per year. Eggs have an incubation period of 60–65 days, hatching during summer. The species is classified as Near Threatened by the IUCN. M. t. indopeninsularis is considered Threatened in Bangladesh, while the population in Myanmar (M. t. edeniana) is thought to be Vulnerable or Endangered. The species appears still to be common in India and Nepal, and is thus overall considered reasonably secure. Where it is under pressure, this is mostly due to hunting for consumption and the pet trade. ^ Asian Turtle Trade Working Group (2000). 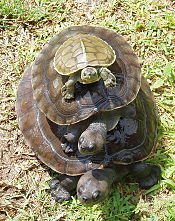 "Melanochelys trijuga". The IUCN Red List of Threatened Species. IUCN. 2000: e.T13039A97373591. doi:10.2305/IUCN.UK.2000.RLTS.T13039A3406900.en. Retrieved 5 December 2017. ^ Fritz Uwe; Peter Havaš (2007). "Checklist of Chelonians of the World" (PDF). Vertebrate Zoology. 57 (2): 235–237. ISSN 1864-5755. Archived from the original (PDF) on 17 December 2010. Retrieved 29 May 2012. ^ a b c d "Indian black turtle (Melanochelys trijuga)". Arkive.org. Archived from the original on 2013-04-26. Retrieved 2013-03-17. ^ Asian Turtle Trade Working Group (2016). "Melanochelys trijuga". IUCN Red List of Threatened Species. IUCN. 2016: e.T13039A97373591. Retrieved 14 September 2016. Mitchell, Joseph C.; Rhodin, Anders G. J. (1996). "Observations on the natural history and exploitation of the turtles of Nepal, with life history notes on Melanochelys trijuga". Chelonian Conservation and Biology. 2 (1): 66–72. Schweigger, A.F. (1812). "Prodromus Monographia Cheloniorum auctore Schweigger". Arch. Naturwiss. Mathem. 1: 271–368, 406–458. Mukherjee, D.; Nixon, A.M.A. ; Bhupathy, S. (2006). "Observations on the Morphometry of two subspecies of Melanochelys trijuga from the Western Ghats, India". Turtle and Tortoise Newsletter. 9: 7–9. This page was last edited on 16 February 2019, at 17:57 (UTC).